As the undergrowth tangles itself around the track and station of a long abandoned raceway, an ominous voice rings across the area - "You must escape!". Fear not however, as Rita still has one last race left in her as she catapults you out of the station and soon you are swooping over the rest of the Dark Forest free from the hidden dangers below. The former 'Queen of Speed' lost her crown at the start of the 2010 season, when the Thunder Rock Rally disappeared into the depths of the Dark Forest and Rita was taken over by creeping vines. Faded paintwork and a new soundtrack completed the new look, though despite the attack from the mysterious undergrowth she remains as speedy and thrilling as ever! More recently Rita has faced some real-life misfortune after her launch cable snapped during operation in July 2012. Whilst thankfully no one was hurt in the incident and the resulting downtime was minimal, as a result of the incident there were significant changes to the Dark Forest. 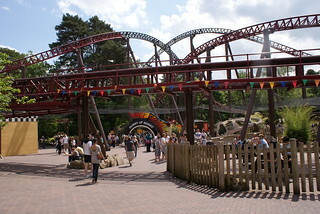 Whilst the Rita Racers and picnic area beneath the track were both permanently decommissioned, the most significant change came in the form of scaffolding tunnels under the ride's launch track to allow guests to pass underneath (whilst the tunnels were being constructed, for a short while all guests had to pass through the Crypt Games to reach Rita's entrance). Whilst the scaffolding tunnels were only intended as a temporary feature, it was almost four years before a permanent replacement arrived, during the first season of Towers Loving Care. 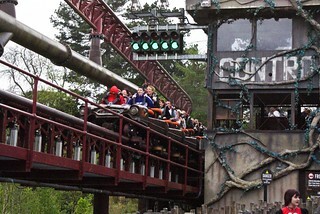 'The Queen of Speed' raced into Alton Towers during the 2005 season and has whetted the appetite of speed demons ever since. Towards the end of 2004, construction fences began to appear within UG Land and by mid-October the entire area was sealed off as construction began on the park's latest coaster project. Essentially built on top of the existing Ug Land, the ride quickly towered over the surrounding area - causing parts of it to be painted green in order to camouflage it within the trees. Rita narrowly missed the start of the 2005 season, opening on April 1st. Visitors on that day arrived to find the Thunder Rock Rally was welcoming them within UG Land and daring them to ride the Queen of Speed. 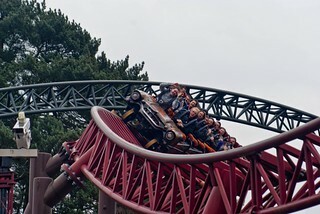 Rita herself was the first thrill coaster at Alton Towers since 1994 to not use the 'Secret Weapon' codename and was the first Intamin Accelerator rollercoaster in Europe. Rita arrived in the park at the start of the 'media gimmick' phase of the park's life and so has been involved in all sorts of publicity stunts from drag queens riding at her opening through to being involved in "bra safety tests". 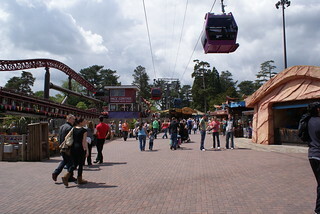 Most notably perhaps, not long after her opening a name-change was in order as the ride was renamed 'Camilla - Queen of Speed' for one day to commemorate the marriage of Prince Charles to Camilla Parker-Bowles. That was the only change of name the ride had until the 2010 season when something sinister appeared directly next door and the ride became known simply as Rita.